These earrings celebrate a life well lived, combining a silver, Maori roimata symbol and a garnet charm. Some people have an extraordinary ability to embrace life with hope and enthusiasm. Mary Steratore's handcrafted earrings can be a spirited token of affection for one of those special people--or wear them yourself as a reminder of the goodness in your life. The dangling, sterling silver bar is actually a Maori symbol called a roimata. The word means "teardrop", but it's used to represent comfort, healing and strength. It’s paired with pendants of square-cut garnet, a stone traditionally believed to promote vitality, courage, passion and love. Comes with a card printed with the charms' meanings. Artist Mary Steratore gathers her materials from around the globe: waxes and molds are made in Italy, silver charms are cast in Thailand, and the semi-precious stone pieces made in India. She assembles the necklace in the USA on a silver earring hooks, also made in the USA. Charms: Roimata approx 1.25"L, garnet stone .25"
Charm symbols are carefully combined with healing properties of the stones to create a piece that is not only inspirational but actually empowering. Lovely choice for a unique gift! 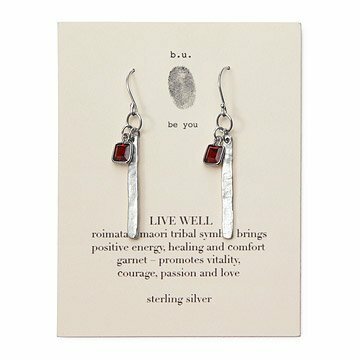 Beautiful, stylish and meaningful earrings for a dear friend. Product is nice. However, assembly i spoor. One of the stones fell off, and now I cant wear them. I just thought these earrings "Be You", would be a good match for a daughter who lives her life well and has many adventures with her family and is a very talented person. They were in Portugal when I gave these to her for Christmas. The garnet is also her birth stone. Really pretty earrings that make a perfect special gift. Our daughter loved the earrings - and the drop silver looks beautiful on her. Great quality, and the silver is perfect for sensitive ears. These earrings are a perfect choice for someone who likes elegant and simplicity combined! They are handmade in the US which is also a quality I look for in gift choice. My daughter in law loved them! I might have to order a pair for myself! You'll not be disappointed if you choose to purchase these earrings! My wife wears these earrings for work and for going out. The simple design with the splash of color match her perfectly. Beautiful jewelry with a lovely sentiment behind it.